Steelhead fishing has been difficult in some rivers because the waters are low and clear. Rain is needed to help bring the levels up and more fish in. Although this is one of the best times to catch walleye from the inland lakes, most had no anglers in sight. Lake Erie: The perch bite continued to hold steady with most boats getting 20-60 fish and even a few limit catches. Fish were caught southeast of Stony Point in 25 feet, east of Stony Point near or in Ohio waters in 27 feet, and near the Dumping Grounds. Emerald shiners on perch rigs with green, orange and chartreuse spinners and/or beads were still the ticket. Catch rates for walleye dropped to one or two fish taken east of Sterling State Park beach in 16 to 18 feet in the early morning when trolling spoons and pink, purple or red bandits and flicker minnows. Those targeting walleye and perch also caught white perch, white bass, freshwater drum, smallmouth bass and channel cats. Large and smallmouth bass along with a few crappie and bowfin were caught along the Sterling seawall. Try tube baits, crank baits or a green pumpkin worm. Detroit River: Yellow perch have been caught around the islands and down at the mouth. A small number were just starting to move into the canals and marinas. A few walleye were caught at the south end of Grosse Ile and north of Calf Island when using a jig and minnow. Some bluegills were caught on wax worms in the marinas. Lexington to Port Sanilac: Night fishing for walleye is worth pursuing at both ports. During the day, pier anglers caught some steelhead and Atlantic salmon however Lexington was more productive for trout and salmon. Those that want to catch Atlantic salmon should start trying around the firearm opener for deer season which is November 15. Right now, the fish are pre-spawn and tend to have lock-jaw, but after they spawn, they are hungry and begin feeding again. This is when fishing picks up and continues to be good through ice-up. Harbor Beach: Night anglers casting off the break-wall continue to catch some walleye at the north gap. Port Austin: A few perch were caught inside the harbor. This is the time when night anglers start to catch walleye off the breakwall when casting spoons or body baits. Saginaw Bay: Boat anglers off Eagle Bay Marina and the Pine River caught some perch in seven to 10 feet. The keepers were running between eight and 10 inches. Shore anglers fishing the lower Pine River caught mostly small perch. Those trolling for walleye caught some nice fish on crank baits out past Buoys 1 & 2. This might indicate the bigger fish are just coming back into the bay as the water cools down. Boat anglers caught walleye about a mile north of Spoils Island and some perch near Buoy #18, in the old shipping channel and off the loading dock near Spoils Island. Perch fishing remains slow and spotty from Quanicassee to Caseville. Boat anglers picked up a few in six to eight feet straight off the mouth of the Quanicassee River. The perch were still not in the cuts and river mouths in big numbers. Currently the water temperatures were in the high 40’s to maybe 50 degrees. Minnows are just starting to move into the river mouths again. Those that want to fish for perch in the river mouths and cuts should start fishing now. If you wait to hear “the perch are in”, by the time you get there it may well be over. Shore anglers at the Finn Road Cut caught bluegills and sunfish but very few perch. Saginaw River: Walleye were caught in the lower river however most of the keepers were 13 to 14 inches and lots of sub-legal fish were caught and released. Likewise, perch anglers fishing the lower river are starting to get some fish in and near the Bay Aggregate Cut, off Bay Harbor Marina and the Saginaw Bay Yacht Club. St. Joseph: No boats made it out to fish so there were no perch reports. Pier anglers were getting a couple steelhead and some whitefish on spawn. Those surf-casting have also taken a couple steelhead. St. Joseph River: DNR staff cleaned out the fish ladders at Berrien Springs, Niles and Buchanan and reported a few Chinook and steelhead in each ladder. Fishing pressure was light below Berrien Springs. South Haven: Had no boat reports. Pier anglers using spawn caught a few whitefish and the occasional steelhead. Black River: Those trolling and shore anglers using spawn caught a couple steelhead. Grand Haven: Boats continue to catch lake trout along the bottom in 90 to 160 feet with yellow spin-glo’s. Pier anglers caught a couple steelhead on spawn. Grand River at Grand Rapids: Those fishing up near the dam are getting a few coho and steelhead. Grand River at Lansing: A odd coho was caught at the Moore’s Park Dam and the North Lansing Dam however there are no big numbers of fish. Try spinners or spawn bags. A few catfish have been caught. Muskegon: Pier and shore anglers reported slow steelhead action. Muskegon River: Anglers are still getting some Chinook salmon although the fish have turned dark. Look for more steelhead after the recent rain. Whitehall: Pier anglers still-fishing with spawn bags caught small coho along with the occasional steelhead in the morning. Those casting jigs or soft plastic swimbaits in the morning or evening caught walleye and the occasional largemouth bass. White Lake: Perch were caught by those using vertical jigs tipped with minnows or wigglers in 30 feet. Cheboygan River: Anglers caught steelhead and the occasional Chinook on real or artificial spawn bags at the lock and dam. The steelhead were three to eight pounds while the Chinook were three to seven pounds. Most were males. Rogers City: The marina, the fish cleaning station and the public restrooms will be closing this week. The launch ramps are still in and should be for a bit longer. One boat was out looking for steelhead or young salmon, but no fish were caught. Alpena: The fish cleaning station is now closed for the season and the marina will be closing soon. The launch ramps at the city launch and Fletcher Street should be in for a while yet. No boats had been out as it has been windy and rough. Thunder Bay River: Had lots of angling pressure as many are waiting for the Atlantic salmon to finish spawning and the bite to pick up which usually happens early to mid-November. Casting spoons and body baits worked best however some were also drifting spawn, beads or flies under a bobber. No steelhead yet but they should be in shortly. Be sure to check the Atlantic salmon for a missing adipose fin and a coded wire tag in their snout. The heads can be turned in at the Alpena Research Station or Clem’s Bait and Tackle. Both have the bags for the fish heads and the forms to fill out. Black River: A couple anglers were casting body baits, spoons, and spinners for walleye, trout, and salmon, but catch rates were low. Harrisville: Had no boat anglers. A few walleye anglers were casting crank baits from the harbor rocks after dark but had little success. Oscoda: Pier anglers caught a few walleye when casting body baits or jigs tipped with minnows in the early morning or after dark. Lake trout and a couple steelhead were caught by those casting body baits and spoons or still-fishing with spawn. Au Sable River: Atlantic salmon are in spawning mode, so it has been hard to get them to strike. Those casting spoons and spinners or swinging and stripping streamer flies had the best luck, with fish up to 12 pounds caught. Atlantic salmon with a missing adipose fin have a coded wire tag in their snout. Anglers are asked to turn the heads in at Wellman’s, Au Sable River Store, Haglund’s, The Dam Store, or Harrisville State Park. The steelhead action picked up a little bit as fish were caught by those casting spoons or bottom bouncing and floating spawn bags and beads. A few post-spawn Chinook up to 18 pounds along with the odd lake trout, coho or lake run brown trout were caught by those casting spoons and spinners or when backtrolling with plugs in the lower river. Tawas: Pier anglers in Tawas Bay are getting some walleye at night and a few pike during the day. Shore anglers have also caught walleye including a few limit catches at night behind the State Police Post when casting jig heads and soft plastics at night. Tawas River: Walleye were hitting at the mouth and in the lower river up to the US-23 Bridge. Au Gres: A couple of walleye and some perch were caught between Point Lookout and Pointe Au Gres in 20 feet. Au Gres River: Some perch were caught in the lower river from the boat ramp lakeward. Harbor Springs: Only one boat had been out recently, and they caught some perch at Harbor Point and on towards Wequetonsing. The dock was still in however not for much longer. Petoskey: The dock at the marina has been pulled out. Boat fishing here appears to be done as no anglers were out. Bear River: Water levels were normal. Angler pressure was low at the dam with the major salmon run tapering off. Anglers could still find a few lake trout or a couple coho. Most were drifting real or artificial spawn and flies up near the dam. The mouth had the most fishing pressure and anglers caught Chinook, coho, lake trout and one small steelhead on spawn, spinners, spoons and crank baits. Traverse City: Cisco were caught along the peninsula and around Deepwater Point in the East Bay by those jigging and trolling. Anglers were looking for perch, but none were caught. Bass were caught along the peninsula and the southeast corner. IIn the Elk River, lake trout and a couple Chinook were caught at the dam on spawn bags. A couple small steelhead were also reported. Perch fishing in the West Bay was hit-or-miss in Bowers Harbor, north of Power Island near the buoys, in Suttons Bay and off Northport. The Boardman River has been slow with only a couple Chinook and steelhead reported at the dam. No sign of lake trout yet. Glen Arbor: The boat launch and docks were still in however there is a lot of debris in the way that would have to be removed before boats could launch. Frankfort: The fish cleaning station has closed for the season. Pier and shore anglers caught steelhead with spawn on the bottom. A couple master angler steelhead have been verified so there are some good size fish moving in. Those casting spoons caught a couple late run coho. Arcadia: The dock was still in and the launch was open but most likely not for long. Portage Lake: Perch anglers are still reporting a fair bite. Some good size fish were caught on the west side of the lake near the buoy. Wax worms, wigglers and minnows worked best in 12 to 18 feet. Manistee: Steelhead and whitefish are still being caught off the pier with spawn bags on the bottom. Manistee River: Boat anglers on the lower river have caught a few fish. There is still a small number of salmon present however they are actively spawning and will be gone soon. Steelhead fishing was tough as the water is low and clear. Ludington: Steelhead are still being caught off the pier with spawn bags on the bottom. Coho are still down at the park. Catch rates were low but anglers were getting a few with artificial lures. Pere Marquette River: Was low and clear which made steelhead fishing more difficult. Pentwater: Had slow fishing however pier anglers caught the occasional coho or steelhead on spawn in the early morning. Pentwater Lake: Perch fishing was good in 20 to 35 feet with dropper-rigs tipped with minnows or small jigs tipped with wigglers and wax worms. Lac Vieux Desert: Anglers have caught even more musky. The fish ranged 30 to 47 inches and were caught on suckers. Walleye fishing picked up and anglers caught good numbers however the majority were 10 to 15 inches. Minnows were the ticket. Very few panfish were caught. Keweenaw Bay: Those trolling in shallow waters had nice catches of coho, brown trout and splake. Most were using a flasher/fly combo, spoons or stick baits. Most of the fish were still tight with spawn so look for fish pushing up into the river soon. Marquette: Had a couple days of decent weather and a few boat anglers were out targeting lake trout and salmon between the Lower Harbor and the “white rocks” area. Most caught lake trout in 30 to 70 feet including a few limit catches. Salmon fishing was slow with only a few Chinook and coho picked up. The end of the breakwall in the Lower Harbor has been a hot spot with anglers getting a fair number of lake trout along with the occasional coho and steelhead. The lake trout have just started spawning so if the weather cooperates there should be a few more chances for anglers to get out and catch more fish. The Carp, Dead, and Chocolay Rivers had meager reports with only a few coho, steelhead and brown trout caught. The coho still look very fresh and many have not spawned so we may see another good push of fish in the rivers soon. Little Bay De Noc: Had walleye and smallmouth bass anglers. The best walleye catches were at night in 18 to 40 feet when trolling stick baits from the Gladstone Bay area south to the Escanaba lighthouse. The better bass catches were from the “Black Bottom” to Farmers Dock with plastics or minnows in 15 to 30 feet. Big Bay De Noc: Had smallmouth bass anglers fishing a little more south from Sand Bay to the Burnt Bluff area. Catch rates were good with minnows in 12 to 25 feet. Munising: In general, things have been slow as most anglers were averaging four hours or more to catch one or two fish. There has not been a good coho run. Catch rates for splake were down as well but those trolling within the bay did catch some fish. Most have now winterized their boats. Grand Marais: The only action had been some steelhead reported off the mouth of the Sucker River. Those surf-casting were using spoons or spawn. Some young small fish had been caught which is good news of a possible year class coming up. Drummond Island: A few yellow perch are still being caught at Ashman Island which is straight west of Scott Bay. Try shiners or small worms a foot off the bottom in 12 to 14 feet. On the calm days, smallmouth bass were caught just off Bruce Point. Anglers were using an orange artificial tube jig with black spots while jigging along the rock piles in four to six feet. Cedarville and Hessel: There was no fishing effort from Cedarville Bay. There were no reports of any perch caught from the finger docks at the Hessel Marina. 1. Take your reels apart to clean them and then grease and oil them. 2. Check out the hooks on your lures and determine if they need replacement or sharpening. 3. Remove the fly line from your reel. If you plan on reusing it consider cleaning it with dish soap. 4. Use rod sleeves to store your rods and so the parts don’t get mismatched. 5. Store your rods vertically to avoid any bends from occurring. 6. Keep your rods at room temperature. 7. Check your waders for any leaks; pinhole-sized leaks can be found by putting a flashlight inside your waders in a dark room. After that you’ll be ready for ice fishing season! But brush up on the basics first! Note: This report is intended to give you an idea of what is going on around the state. Updates come from Fisheries staff and Conservation Officers. 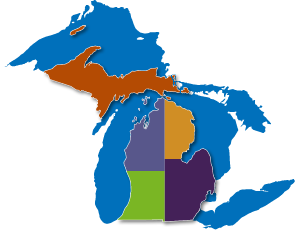 With more than 11,000 inland lakes, the Great Lakes and thousands of miles of rivers and streams, not all locations can be listed. However, it is safe to say if a species is being caught in some waters in the area, they are likely being caught in all waters in that section of the state that have that species.